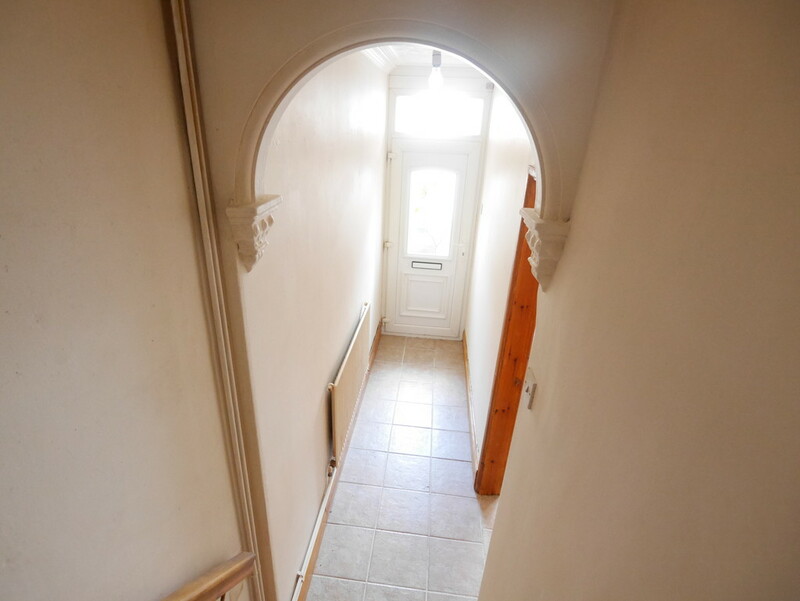 A bay fronted, period mid terraced property that has two double bedrooms and a nursery/study. The property comes to the market with the added incentive of having ‘no upward chain’ thus helping to simplify the whole buying process. In brief the double glazed, gas centrally heated accommodation comprises reception hallway, bay fronted lounge, dining room, room that was formerly the kitchen however the kitchen has been removed and a store room completes the ground floor. 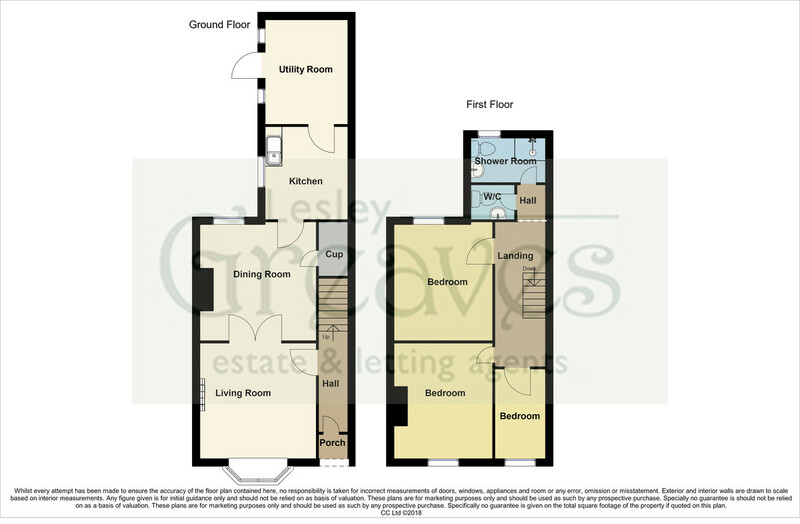 To the first floor is a good sized landing, two double bedrooms and a nursery/study, WC and separate shower room that also has a WC. To the outside there is a small courtyard style garden with gated pedestrian access. To the rear is a low maintenance garden with gated personal pedestrian access. The owners will be installing a sink unit in the kitchen room allowing scope to modernise and create the kitchen that you want after purchase. OPEN ENTRANCE PORCH WITH TILED FLOOR. RECEPTION HALLWAY uPVC double glazed entrance door with inset coloured leaded glazing, tiled floor, radiator, decorative archway and stairs to the first floor landing. LOUNGE 14′ 6″ (in to bay) x 12′ 3″ (in to alcove)(4.44m x 3.74m) uPVC double glazed bay window to the front, radiator, meter cupboard, feature fireplace and hearth with inset coal effect gas fire, tiled floor, wall and ceiling light points and double doors through to the dining room. DINING ROOM 12′ 8″ x 12′ 2″ (3.88m x 3.73m) uPVC double glazed window to the rear, radiator, tiled floor, under stair cupboard and wall and ceiling light points. KITCHEN 9′ 7″ x 8′ 7″ (2.93m x 2.64m) uPVC double glazed window to the side, uPVC double glazed door to the store room. The kitchen room is currently not fitted with any cupboards however a sink unit and cupboard will be fitted to enable a purchaser to acquire a mortgage; they will then be able to install their own kitchen in full after purchase. STORE ROOM 11′ 1″ x 5′ 4″ (3.38m x 1.63m) Two wooden framed single glazed windows and door to the rear garden, tiled floor and light point. LANDING A spacious, balustraded landing with wooden floor and loft access. BEDROOM ONE 12′ 2″ x 10′ 5″ (in to alcove)(3.72m x 3.19m) uPVC double glazed window to the front, wooden floor and radiator. BEDROOM TWO 12′ 8″ x 8′ 11″ (3.88m x 2.74m) uPVC double glazed window to the rear, wooden floor and radiator. STUDY/NURSERY 9′ 5″ x 5′ 0″ (2.89m x 1.53m) uPVC double window to the front, wooden floor and radiator. WC Low flush WC, pedestal wash basin, tiled walls and wall mounted gas fired boiler. SHOWER ROOM Low flush WC, pedestal wash basin, shower cubicle with electric shower fitted, radiator, part tiled walls and opaque uPVC double glazed window. OUTSIDE To the front is a low maintenance walled courtyard garden with gated pedestrian access. To the rear is a private garden landscaped with low maintenance in mind and gated pedestrian access.